Heeft u een vraag voor East Of Love Bed and Breakfast? Als u zoekt naar een gunstig gelegen hotel in Hualien, kijk dan niet verder dan het East Of Love Bed and Breakfast. Het levendige stadscentrum is slechts 1.6 km verwijderd. Ook gemakkelijk te bereiken zijn Hualien Stad Bibliotheek, Tianhuitang, Zhongshan Park. Profiteer van de ongeëvenaarde dienstverlening en voorzieningen in dit hotel in Hualien. Gasten kunnen gebruikmaken van hotelfaciliteiten als gratis wi-fi in alle kamers, wasserette, snel in- en uitchecken, bagageopslag, wi-fi in openbare ruimtes. Gasten kunnen kiezen uit 4 kamers, stuk voor stuk plezierig en comfortabel ingericht. Daarnaast garanderen de talrijke recreatieve mogelijkheden dat u zich tijdens uw verblijf kunt vermaken in het hotel. Ontdek een boeiende mix van professionele dienstverlening en een breed scala aan faciliteiten in het East Of Love Bed and Breakfast. We stayed in East of love homestay for just one night for a quick Hualien visit. Our host Ms.Yz Chen was gracious to drive us herself to vegetarian restaurants nearby and tried her best to communicate and help us with our stay needs inspite of the language barrier. On the same night when I had a bad medical emergency she drove me to a nearby clinic that was just closing down and convinced the doctor to attend on me as I was a tourist and had to leave the next day. Our trip was saved from being a disaster and we owe it to her for that. Thanks again, Ma'am! Even for just one night, I enjoyed my stay at this hotel. The host is a very kind and friendly lady who will attend to all of your needs. Will surely stay again if I have a chance to go back to Hualien. We stayed 3 nights at here. 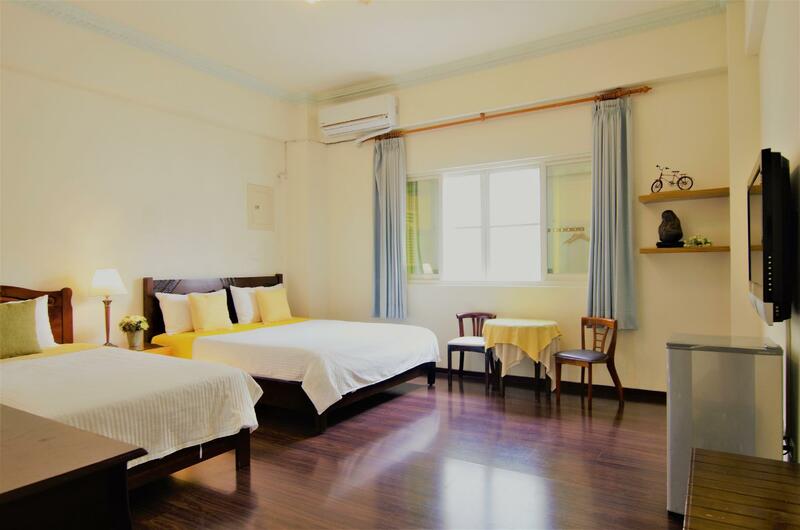 Location very near to Hualien train station and Taroko bus station, walk only 5 minutes. We walked more than 30 minutes to Dongdamen night market, pass a lot of restaurant and souvenir shop, stop at local bento restaurant and having dinner there before continue again to night market. Take a taxi back to guest house might save your time. The owner Ms Yi Chen and her husband are very friendly and helpful. She told us how go to Hualien East Rift Valley by bus (no. 303), the bus station just in front of souvenir shop, right side is bus to Taroko, and left side is bus to Hualien East Rift Valley. Free laundry and detergent, feel convenient can wash our dirty clothes before continue our trip to another city. Will back again next time. 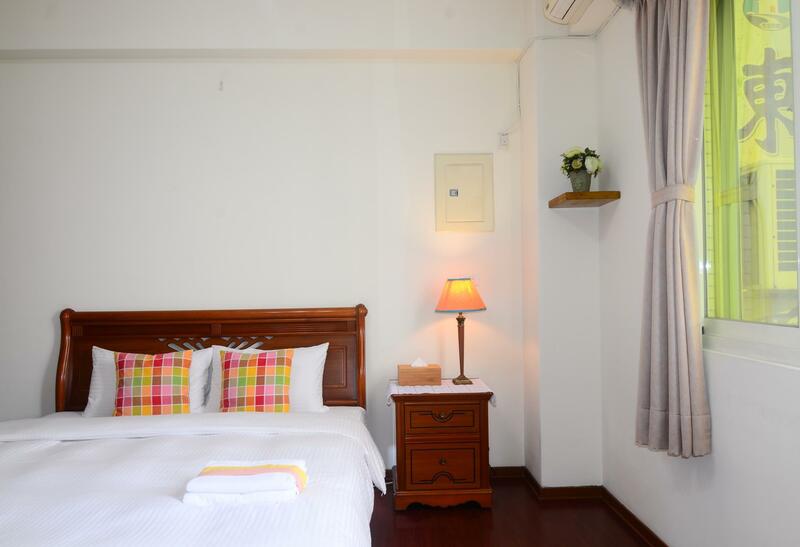 East of Love Bed and Breakfast Guesthouse located very near to Hualien Train Station and Bus terminal heading for Taroko (Orange Terminal), just 5 minutes walk. There are lots of food store and seven eleven near the hotel and open in the early morning. 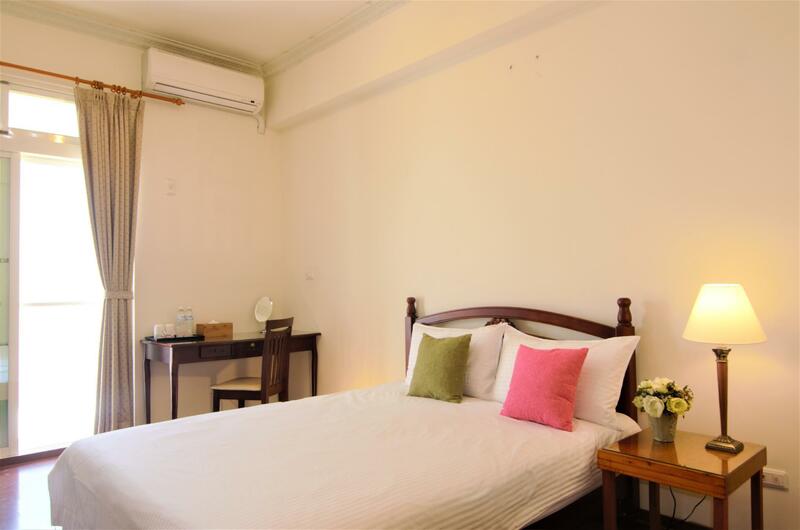 Both bedroom and bathroom are spacious, very clean and our room have open terrace. The lightning was great and amenities also quite complete. The owner was a very kind couple, they are very welcome to us and really make sure give us proper information about everything we need. Hotel location also quite far to the city centre and night market, about 20-30 minutes walk, but it's very safe to walk in Hualien. The location is very near to the Hualien Train Station. And the owners are very helpful. The kind lady explained to us the main attractions and had an english map for easier understanding. She helped arranged for my birthday cake as planned by my husband. They also offered umbrellas since it was raining. The room is clean and large and came with a balcony. The TV had english channels as well. Overall a great stay. We would definitely return to this place! this is kind of home stay, room is clean, toiletries are available. some steps will lead you to find local shop selling confectionery, restaurants, bus and train station . if you just want to explore the city and go to toroko, this is a better one. The hotel is close to Hualien railway station. Hotel owner is very kind and warm. The owner is extremely kind and helpfull. Room is big and Location is great if you want to be close to the train station (and so a little bit further to the night market/city center. Would definitely recommend it ! My mother and I stayed here for two nights and had a very pleasant stay. The owner was very friendly and helpful, and she speaks good English. The place is about a 3-minute walk to the train station, as well as the bus station if you're planning to take the shuttle bus to Taroko. The room was clean, very comfortable, and quiet. Btw, the Agoda listing showed that towels are not provided, but we did, in fact, receive full-size bath towels. The only slight downside was that the wifi was very weak in our room, but that was a minor thing that didn't overshadow our wonderful stay. I would definitely stay there again and recommend it to others. 5 minute walk from the train station and easy to find . It is close to the main road and about a 25-30 minute walk to night market, downtown area and beach. Plenty of bicycles available for free to explore around town. Ms. Chen is very enthusiastic and friendly. Her English is passable and she was quite helpful suggesting places to eat and rent a scooter. We felt very welcome staying here. The room was nice enough. Definitely recommended for a friendly and cozy stay! The lady who hosted me was very friendly and kind. She gave me directions to the night market, recommended places for me to visit and etc. The location was very close to Hualien train station, which was exactly what I was looking for. It is quite a distance to the city area, about 30 minutes walk. The lady offered to lend me her bicycle but it was drizzling so I opted to walk instead. The room was really big, spacious and clean. 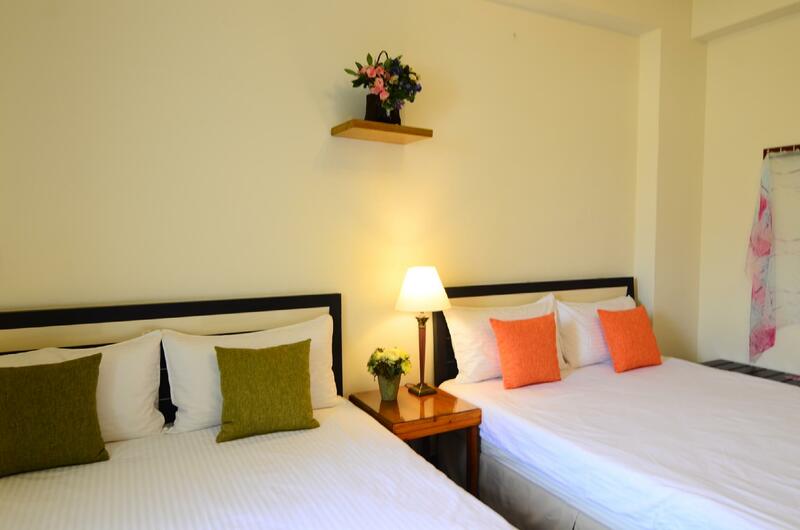 Overall, it is value for money and good place to stay if you're looking for a place close to the train station. On arrival we received tea/snack and was provided information about everything in the area and where to go. Our room was serviced daily, Free water, toiletries, tea/coffee, very clean, large room nice view, big windows, quiet, good shower/spa bath. Location is close to the train and bus station which is very good especially going to the Gorge. The owner is more than helpful she showed us where to eat cheap food, and even gave us fruit when we departed the B & B. Even though it is a B & B no breakfast is supplied but did not worry us. Would highly recommend staying here. Very safe and secure. Walk distance to main train station and many food stalls and restaurants surrounding. Room is very simple but comfortable and clear. Home stay's owner is very friendly, helpful and caring. Will stay this home stay again if revisit Hualien. The location is near Hualien Railway Station, within 10 min walk. The houseowner are friendly n nice and provide us with the necessary assistance eg. booking of private driver n tour guides to Taroko, directing us around Hualien main district. Room are big and nice to live in, No different from any hotels standard. As all reviewer said about the owner, we really agree, both of them very kindly also their relative's family. So helpful.. our room also big and has a balcony so circulated of air make our room cold without open the AC. The total room not much, make you relax..
Ms Liu, the owner operator is friendly and helpful. This homely run hotel has free bicycles for use as well. Facilities clean and room decoration is pleasant. A bit hard to find because its a small establishment. Otherwise highly recommended. they do not provide bath towels to guests and their excuses: afraid guests will take them away(happen before)...I just wonder why those greedy guests want this cheap stuffs and worst of all its has also been used by hundred if not thousand others guests as well?? After arguing with the owner and stated that this is a basic thing that hotel must provided to it guests and after all we also didn't bring any, at last she give us two instead of four(towels). Do not hire taxi through this hotel if you want to visit Taroko Gorge as they charged much as usual, in our case they charged us NT1900 for four hours instead of NT1200-1500(we learn later).The company they called provided us an older ageing toyota altis. There all plenty of the new branded toyota wish that ready for hire around the hotel(we find out later). Giving the choice I would rather spend slightly more to stay at standart hotel instead of this home stay type hotel in term of more luxurious service next time when we visit this beautiful city again. It was a great experience to stay in this family hotel. The location is great, only short walk from HuaLien main train station (though we took some times to find it because it's located at small lane). The room is clean and nice. We stay at quad room. Washing machine and detergen is provided for us to do laundry. Friendly owner Ms Wei provided us alot of good tips to tour around the area. Free bicycle rental, we ride it to the nearby night market 自強夜市 which is about 15 minutes away. Free wifi. There is no breakfast provided but we can easily find food around because of the good location. Value for money. Will definitely stay here again for the next visit! The lady boss willing to go for extra miles, assist in tour arrangements. The driver, Mr Liu lend us his umbrella on a raining day though the trip was ended. The team look into details and cater the guests needs. Excellent. Owner is nice and friendly, location is very near to Hualien Railway Station. Room is clean but do note that there is no lift.